Ultra-affordable, semi-ultraportable. Hewlett-Packard’s latest 15-inch budget notebook is a slim one indeed—and it’s hard to find fault in its price. But is the increased portability worth the sacrifice elsewhere? The HP Pavilion Sleekbook 15 has a short list of features that make it worth picking up, such as its webcam, acceptable battery life, full-sized keyboard and its price of under $500. But if you’re looking to purchase an laptop that will keep up with you, especially if you’re a heavy multitasker that doesn’t want your machine to crumble after opening a couple of tabs in your Internet browser of choice, then you may want to look elsewhere if you’re looking for something a little more memorable. Despite niceties like a large touch-capacitive display and a spacious hard drive, the HP Pavilion TouchSmart 15z-b000 Sleekbook's so-so performance and short battery life ultimately make it a questionable choice in the face of better-featured competitors with the same price or better. Conversely, the TouchSmart 15z-b000's AMD Radeon HD 7600G GPU outshined the rest of the pack when it came to rendering 3D graphics. Its 3DMark11 scores (1,367 points in Entry-level settings, 278 points in Extreme mode) outflanked the Asus S500CA-DS51t (1,168 points and 210 points, respectively) as well as the Acer M5-581T-6405 (1,194 points and 215 points, respectively). Nevertheless, its GPU still fell in line with the others in its failure to crack the 30 frames per second (fps) playability barrier in both Aliens vs. Predator and Heaven. But we said you could do worse, and we meant it: Not the fastest, lightest, or longest-lived, the Pavilion TouchSmart Sleekbook is still a well-equipped, stylish, and attractive laptop with a responsive touch screen that makes a big difference in dealing with Windows 8. Our only hesitation in recommending it is our suspicion that the under-$750 touch laptop market is about to explode, and you'll want to keep your eyes open for possible alternatives. HP's not the only vendor eager to make up for last Christmas. The HP Pavilion Sleekbook 15z-b000 does offer a few strong points including its colorful 15.6" touch-enabled display, solid speakers, and large 750GB HDD. While the chassis doesn't look like much, the glossy plastic cover is actually far more durable than expected. Of course the Sleekbook has its downsides as well with an uncomfortable touch pad and keyboard, short battery life, and lackluster performance. Still at this price point, the HP Pavilion Sleekbook 15z-b000 is solid choice for consumers looking for an entry-level notebook and don't mind conceding on performance. 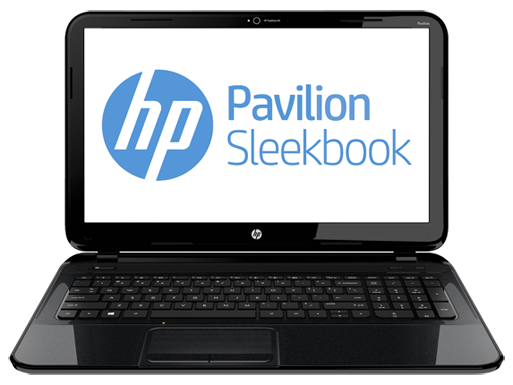 The $649 HP Pavilion TouchSmart 15z-b000 Sleekbook delivers impressive audio and a seamless Windows 8 touch-screen experience. You also get a comfortable keyboard and well-designed touchpad. However, this laptop's AMD processor offered sluggish performance, and its 4-cell battery lasted less than four hours. After bemoaning the lack of laptops at any price with both a touch screen and discrete graphics, HP turns up with something that gets my attention.With a great design for the price and some better-than-expected graphics power, the HP Pavilion TouchSmart 15z-b000 Sleekbook may be worth overlooking its shortcomings if you're on a tight budget. HP's Pavilion Sleekbook 15z-b000 sports a nice, large screen for an economy notebook, as well as a pleasingly thin profile. But its budget-laptop aesthetics, combined with disappointingly short battery life and subpar productivity performance, make it hard to recommend unless you simply have to have a thin laptop with a large display and can't spend much more than $500. The HP Pavilion Sleekbook 15z-b000 ($554.99 direct) is a configure-to-order ultraportable laptop that starts at $479.99 base, though our review unit came with an upgraded AMD A8 processor that added a $75 premium. 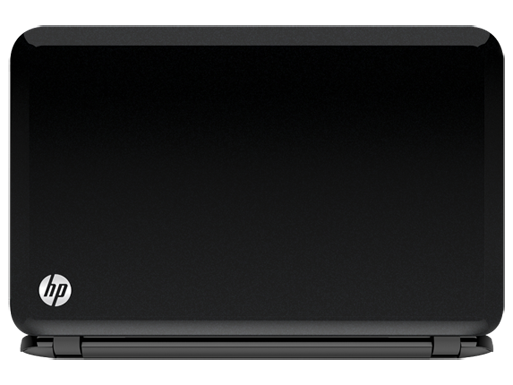 The HP Pavilion Sleekbook 15z-b000 is a decent "round the house" ultraportable laptop, but please keep the AC adapter handy if you surf the Web unplugged. 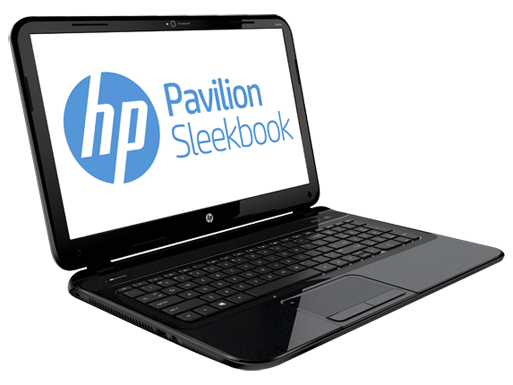 The HP Pavilion Sleekbook 15z-b000 is a tractable, utilitarian ultraportable, with a good feature set. It's going to serve a general user well, particularly if you're limited to a sub-$600 budget and need a full keyboard. However, the Asus VivoBook X202E is a slightly better choice for learning Windows 8 on account of its touch screen, and the Editor's Choice Acer Aspire V5 is a better overall choice if you really don't want to bother with a touch screen. 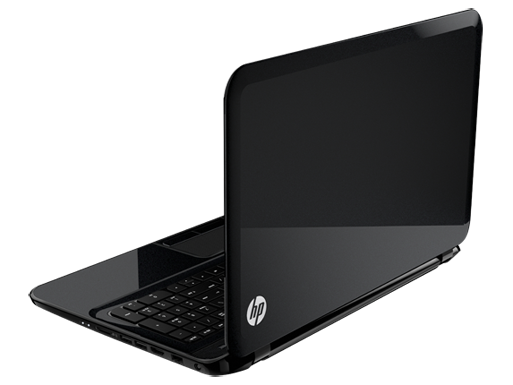 The HP Pavilion Sleekbook 15z-b000 is an AMD quad-core powered Windows 8 Ultrabook laptop that has a lightweight chassis and decent performance. It does have below average battery life and mediocre graphics performance, but for some users, the latter won't matter much. 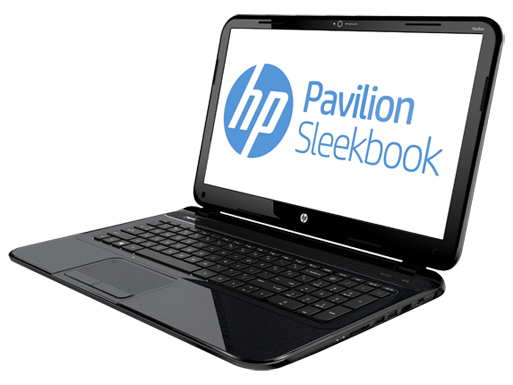 Priced at $474, the HP Pavilion Sleekbook 15z-b000 delivers Ultrabook-like portability along with pretty good sound for the price. You also get a good selection of ports (including Ethernet), a zippy boot time and a cool-running chassis. Ultimately, though, the flaky Windows 8 gesture support and very short battery life are turn-offs. AMD Radeon HD 7600G: Processor graphics card that is built into the Trinity A8 ULV series APUs from AMD. Based on the VLIW4 architecture of the Radeon HD 6900 desktop series. Non demanding games should be playable with these graphics cards. » Further information can be found in our Comparison of Mobile Graphics Cards and the corresponding Benchmark List. A8-4555M: ULV-Trinity (19 W), 2 modules 1.6 - 2.4 GHz, HD 7600G GPU» Further information can be found in our Comparison of Mobile Processsors. 61.83%: Such a bad rating is rare. There exist hardly any notebooks, which are rated worse.